Gingerbread and gingersnaps have a long history related to Christmas - gingerbread houses, gingerbread men, and even gingersnap tree ornaments. 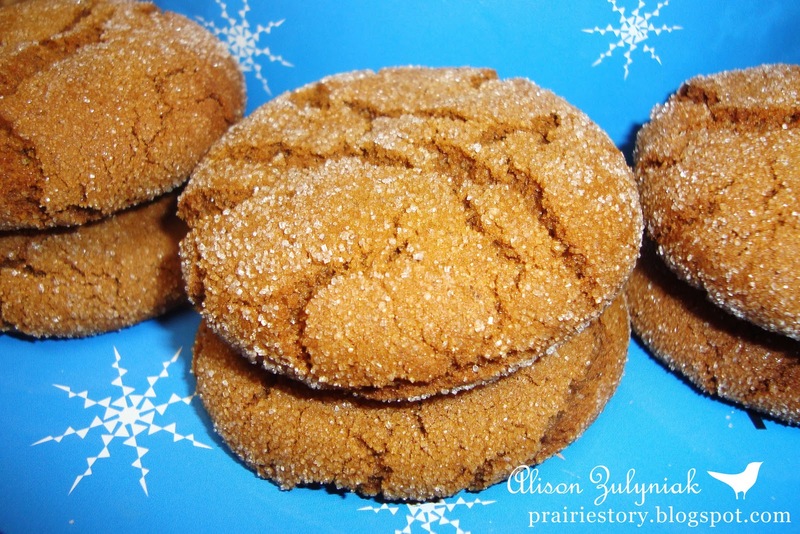 I keep it simple with my Gingerbread Cookies that have a snap on the outside, but chewy on the inside! - Combine first five ingredients. Beat well. - Sift dry ingredients together, then add to wet. Stir until just combined, don't over work dough. - Form into balls and roll in white sugar. Place on baking sheet and flatten slightly. - Bake @ 375° for 10 minutes. This is definitely a classic recipe and one of my favourites. Your gingerbread cookies looks fabulous! This is one delicious festive cookie! Alison, I have just made these and they are DIVINE! What a fantastic recipe, such a great balance of flavours and the crunchy chewy thing they have going on is positively addictive. I'm going to try to link to this recipe from my facebook page and I will tweet it too. Great recipe!! I have a recipe that is very similar to this one and I *ADORE* these golden, chewy little gems! YUMMY!! !